If you asked the typical American if they would rather be French, the answer would likely be one of horror. Conventional wisdom indicates that France is now becoming the new sick man of Europe, while the US leads the developed economies in medium term outlook. On the other hand, the life of a typical American citizen is worse compared to the typical French citizen. Let`s go to the numbers. The chart below compares Consumer Confidence for US consumers based on income with the red line showing confidence for consumers with annual incomes greater than $50K and the blue line showing confidence levels for consumers with incomes between $35K and $50K. While the two consistently tracked each other relatively closely, in the current recovery the confidence gap has been steadily widening. We have highlighted this trend numerous times over the years, but as the recovery has progressed, the gap has only widened. The final chart shows the spread in confidence levels using a six-month rolling average to smooth out month to month moves. 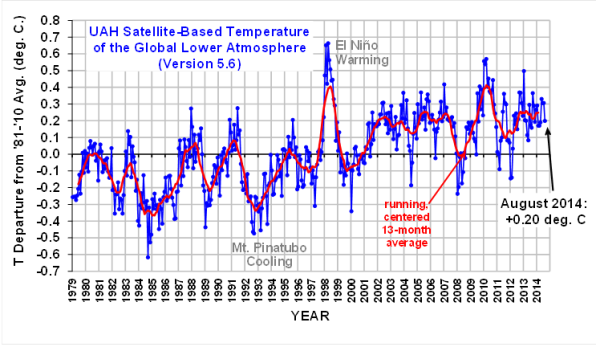 At a current average spread of 30.8, the gap is now less than half a point less than its all-time record high of 31.17 reached in June. One would expect that as we get deeper and deeper into the economic recovery, the rising tide would start to lift all boats, but for lower income Americans the pickup in confidence has been under pressure. Anyone reading the papers in the last several months has read about the widening gap between the rich and poor, and these numbers show how it has impacted confidence. Optimism may be harder to come by these days. More than half of Americans surveyed in a Harris poll released Tuesday identified themselves as being lower-middle class or working class with low economic security. And 75 percent said they're being held back financially by roadblocks like the cost of housing (24 percent), health care (21 percent) and credit-card debt (20 percent). "The most disappointing aspect is that 45 percent think they'll never get their finances back to where they were before the financial crisis," said Ken Rees, CEO of the Elevate credit service company, which commissioned the survey. "And a third are losing sleep over it." 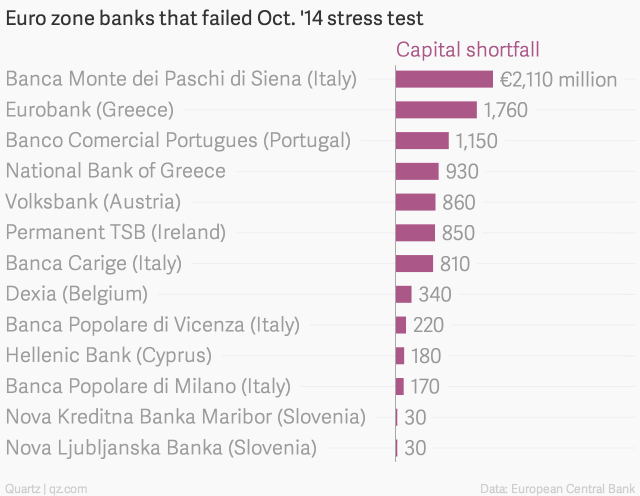 The European Central Bank is set to release the results of its latest stress tests on euro area banks this Sunday. Those more interested in the fragility and resilience of euro area households should focus instead on a new working paper from ECB researchers. The economists first looked at income after taxes, debt service, and basic living costs across and within countries. As long as this number is positive, a household is not in distress. Even when it is negative, people with sufficient liquid savings are not considered to be in trouble as long they can hold out for a certain amount of time. And even some households that don’t have enough emergency cash may avoid defaulting on their debts for various reasons. The most interesting finding from this research is that French households are the most financially resilient while German ones are surprisingly fragile. And finally, the typical French household tends to have more liquid savings than the rest of the euro area. Of course, almost all Europeans are in better shape on this score [liquid savings] than Americans, two-thirds of whom lack sufficient savings to cover three months of expenses, according to Federal Reserve survey data. The latest Credit Suisse global wealth study confirms this observation. While the average American household wealth is slightly higher than the French, they are not all that different. What`s different is the median French adult has 2.6 times the wealth of the median American! Such a large difference between the average and median indicates that wealth is more concentrated in America compared to France. 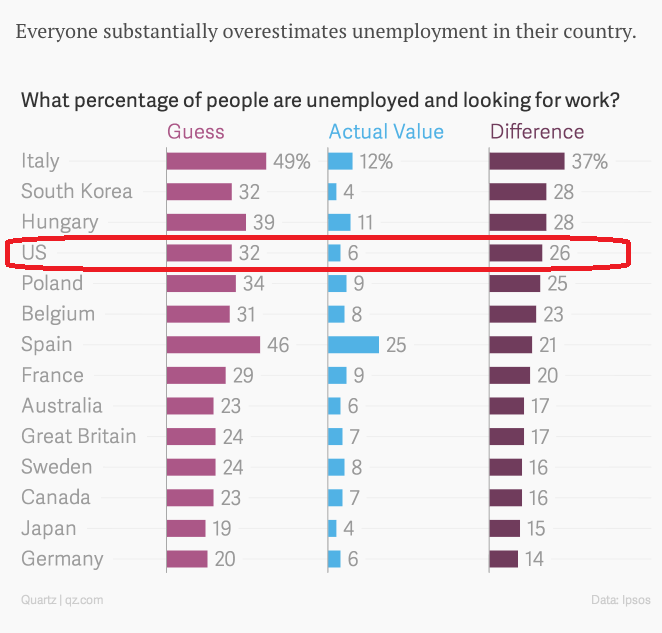 Indeed, the table shows that there are far fewer poor people in France compared to the US. As the table shows, both the French and Americans believed that "working hard" is the most important quality to getting ahead. Both ranked "having a good education" as second. However, the magnitude of the answers are also telling, as Americans gave "working hard" a rank of 73 compared to 25 for the French. Similarly, the respective ranks for "having a good educating" were 71 and 24. These figures demonstrate that the American Dream is still alive and Americans are more driven to succeed than the French, though the payoffs indicate otherwise. Lies, damned lies and statistics - interpret them any way you want. But these numbers indicate that the typical American adult would likely have a much better quality of life as a French citizen. Just don`t be too rich in France, though. The taxes are horrendous and the growth outlook for investors is awful. In these pages, I have tried very hard to remain apolitical in my writings. While I hold certain political positions, I don't let them affect my investment views. It it with some alarm that I am seeing more instances of investment pundits expressing their political views. In such cases, I start to wonder whether their politics are affecting how they invest. It can lead to an attitude of "the policy is wrong-headed and will end in tears, so it's time to get bearish." Such approaches can be fatal to portfolio returns. Launched by Larry Summers last November, a meme is burning its way through established academic economic circles: that we have entered into a period of – gasp! – secular stagnation. But while we can see evidence of stagnation all around the developed world, the causes are not so simple that we can blame them entirely on the free market, which is what Larry Summers and Paul Krugman would like to do: “It’s not economic monetary policy that is to blame, it’s everything else. Our theories worked perfectly.” This finger-pointing by Keynesian monetary theorists is their tried and true strategy for deflecting criticism from their own economic policies. Where orthodox neo-Keynesian policies like large-scale deficit spending and aggressive monetary easing have been resisted – as in Japan years ago or in the Eurozone debtor countries today – lingering depressions are commonly interpreted as tragic signs that “textbook” neo-Keynesian economic policy could have prevented the pain all along and that weak economic conditions persist because governments and central banks are not doing enough to kick-start aggregate demand and stimulate credit growth at the zero lower bound. In places like the United States and Japan, where neo-Keynesian thought leaders have already traded higher public debt levels and larger central bank balance sheets for unspectacular economic growth and the kinds of asset bubbles that always lead to greater instability in the future, their policies have failed to jump-start self-accelerating recoveries. Even in the United States, when QE3 has been fully tapered off, I would expect to see the broader economy start to lose momentum once again. We’ve tried countercyclical deficit spending to resist recessions, procyclical (and rather wasteful) deficit spending to support supposed recoveries, and accommodative monetary easing all along the way (to lower real interest rates and ease the financing of those pesky deficits); but growth has been sluggish at best, inflation has been hard to generate, and labor market slack is making it difficult to sustain inflation even when real interest rates are already negative. Call me a heretic, but I take a different view than the economists in charge. To my mind, the sluggish recovery is a sign that central banks, governments, and, quite frankly, the “textbook” economists (despite their best intentions) are part of the problem. As Detlev Schlichter commented in his latest blog post (“Keynes was a failure in Japan – No need to embrace him in Europe”), “To the true Keynesian, no interest rate is ever low enough, no ‘quantitative easing’ program ever ambitious enough, and no fiscal deficit ever large enough.” It’s apparently true even as debt limits draw closer. While the academic elites like to think of economics as a reliable science (with the implication that they can somehow control a multi-trillion-dollar economy), I have repeatedly stressed the stronger parallel of economics to religion, in the sense that it is all too easy to get caught up in the dogma of one tradition or another. And all too often, a convenient dogma becomes a justification for those in power who want to expand their control, influence, and spending. Whereas an Austrian or monetarist approach would suggest less government and a very light handle on the monetary policy tiller, Keynesian philosophy gives those who want greater government control of the economy ample reasons to just keep doing more. Monetary policy has been able to mask a multitude of our government’s fiscal sins. My worry for the economy is what will happen when Band-Aid monetary policy can no longer forestall the hemorrhaging of the US economy. Long before we get to 2024 we will have a crisis. In past years, I have expected the problems to come to a head sooner rather than later, but I have come to realize that the US economy can absorb a great deal of punishment. But it cannot absorb the outcomes depicted in those last two charts. Something will have to give. And these projections assume there will be no recession within the next 10 years. How likely is that? What happens when the US has to deal with its imbalances at the same time Europe and Japan must deal with theirs? These problems are not resolvable by monetary policy. An even scarier scenario is what will happen if we don’t deal with our fiscal issues. You can’t solve a yawning deficit with monetary policy. Further, at some point the velocity of money is going to reverse, and monetary policy will have to be far more restrained. The only reason, and I mean only, that we’ve been able to get away with such a massively easy monetary policy is that the velocity of money has been dropping consistently for the last 10 years. The velocity of money is at its lowest level since the end of World War II, but it is altogether possible that it will slow further to Great Depression levels. When the velocity of money begins to once again rise – and in the fullness of time it always does – we are going to face the nemesis of inflation. Monetary policy during periods of inflation is far more constrained. Quantitative easing will not be the order of the day. Notwithstanding the fact that the great austerity experiments in Europe have been unmitigated disasters, it seems futile to argue with someone for whom a theory represents a form of religious doctrine. From reading John Mauldin, I seriously question how much his views color the hedge fund managers and portfolios that he offers. 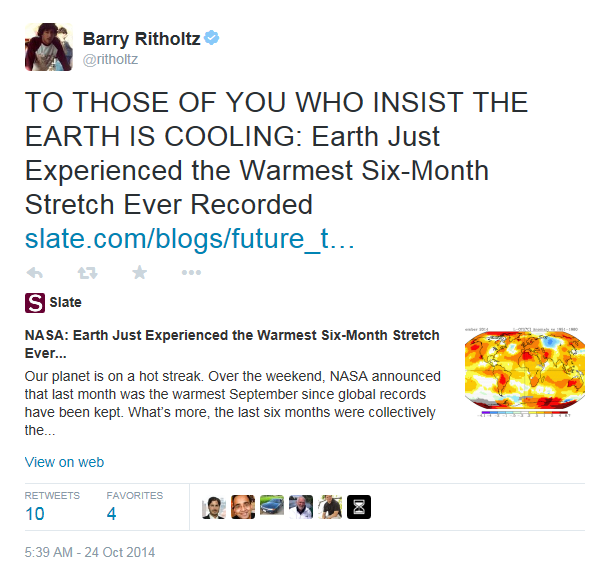 To his credit, I have not seen Barry's climate change concerns creep into his investment views. I have not seen him has write anything to the effect that current policies are likely to lead to disaster, so therefore portfolios should be positioned for that outcome. 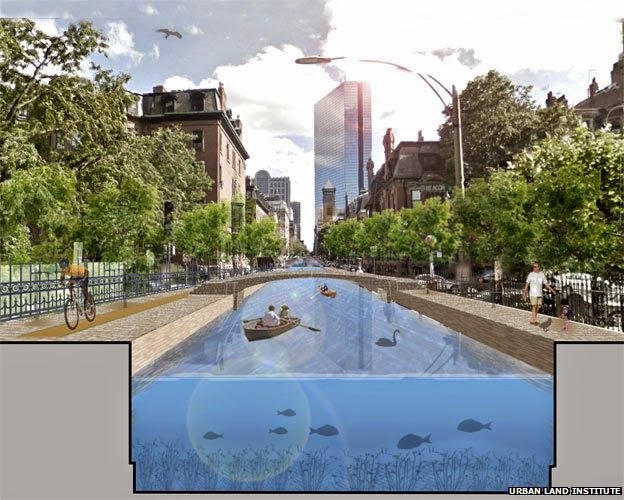 Nor have I seen him advocate for financing such *ahem* speculative projects like this in Boston. Imagine a manager who has an investment theme that isn't working out. What is the procedure for decide on whether to stick to his guns and what is the procedure for re-examining and re-validating his models? The answer can be revealing of the thought processes that drive that manager's investment philosophy and process. To sum up, I reiterate my position that it`s perfectly normal to hold political views. Just don`t let them affect your portfolios. I demonstrate this by singling out a very unique group - the Fed haters. Fed haters are a special species of investors who generally believe that what the Fed is doing is ultimately inflationary and, ultimately, the Fed will lose control of its policy and the US will get caught up in an inflationary spiral. In an interview with Goldman Sachs earlier this year, Druckenmiller sounded equally futile about his place in an easy-money, QE market. He, like a lot of hedge fund managers, has been critical of Fed Chair Ben Bernanke's policies. Unlike other hedge fund managers, though, he's open about his own feelings of inadequacy because of those policies. It's not predicting anything the way it used to and that really makes me reconsider my ability to generate superior returns. If the most important price in the most important economy in the world is being rigged, and everything else is priced off it, what am I supposed to read into other price movements? Bill Fleckenstein is another well-known investment professional who is a Fed-hater, but he also knows the limitations of his approach (via Business Insider). In a new interview with King World News, long-time Fed-critic Fleckenstein addresses the startling shouting match he got into with CNBC anchor Jackie DeAngelis on Tuesday. For years, Fleckenstein had been warning investors through interviews that the loose monetary policies of the various developed market central banks would end in financial catastrophe. And the manner in which he sounded his warnings made it seem as if this doom would be somewhat imminent. "At what point are you willing to concede that you've misunderstood monetary policy?" DeAngelis asked point blank. This had Fleckenstein understandably incensed. "I don't misunderstand monetary policy," he responded. "I closed my short fund in 2009 because I knew the Fed would print money ... If you want to pursue idiots like the Fed, and their crazy policies, and you think you can get out in time, go for it." The chart below shows the disagreement, as measured by the interquartile range, among participants in the SPD and the SEP for two-year-ahead projections of the FFR. 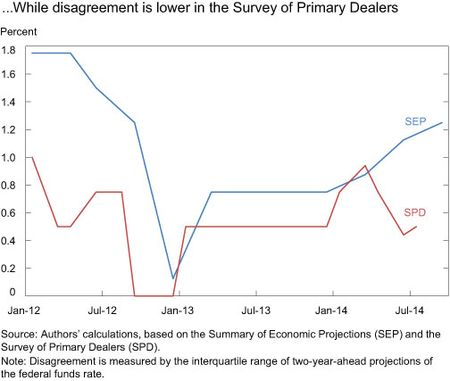 While there is some dispersion among primary dealers’ forecasts, FOMC members have disagreed considerably more over the past three years. Overall, the FOMC has tended to disagree more about the path of the FFR than market participants. One potential explanation for the difference is that FOMC members have disagreed more about the outlook for unemployment and inflation. However, we can’t rule out that private-sector participants disagree less about the outlook because they disagree less about the future path of the policy rate. That said, disagreement about unemployment in the longer-run should not be driven by policy expectations, and disagreement about this variable, at least until very recently, has been lower in the SPD than in the SEP. In addition, even if disagreement about the outlook in both surveys is the same, we should expect the FOMC to disagree more because private forecasters attempt to predict the most likely policy outcomes, whereas FOMC members report their views on the appropriate path for the FFR. That is, the dots represent policy prescriptions of each FOMC participant, rather than forecasts. Academics focus on being right. Investment professionals focus on making money. Don`t confuse the two. Don’t Fight the Fed – Fed policy influences interest rates and liquidity – money moves markets. You can hold any political view you want. Just be pragmatic when it comes to managing your portfolio. In my most recent post, I indicated that I expected US stock prices to move up further, but in a choppy fashion (see Correction, what correction?). For more risk averse investors and traders who are afraid of the volatility, I can suggest another way to approach this market. Under these circumstances, directional market volatility could be mitigated with a pairs trade. Buy the outperforming sectors and groups and short the underperforming sectors and groups. There are a few that could be looked at. One possible long position is Healthcare. 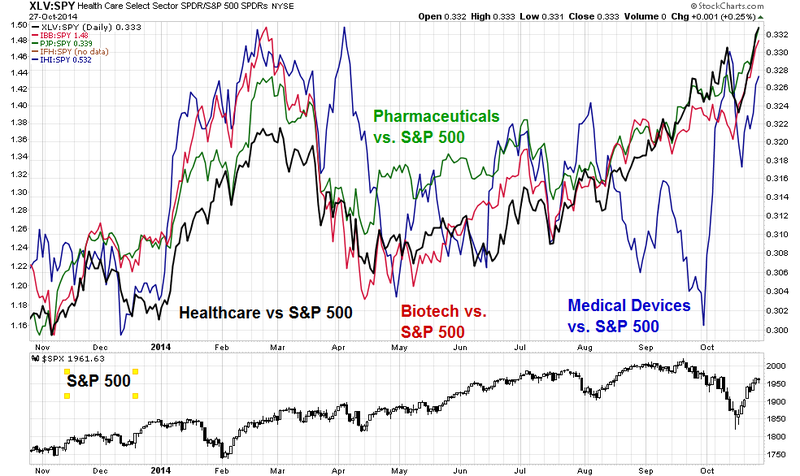 The Healthcare sector and its industries have been fairly consistent outperformers in the last year, even in the recent correction. The chart below shows the relative performance of this sector and its industries compared to the SPX in the past year, as well as the SPX in the bottom panel. I do have one caveat. The relative performance of the Medical Devices group, as represented by the ETF IHI, seems overly volatile and should probably be avoided as a long candidate. Another long candidate might be the NASDAQ. The NASDAQ 100 has been on a tear since May. By contrast, smaller stocks, as represented by the Russell 2000 small caps (IWM) or mid-caps (MDY) have continued to underperform during the same period. Disclaimer: Pairs trading represent a relatively exotic position and require a higher level of sophistication that is not appropriate for everyone. Do your own due diligence and know your own risk tolerances before entering the trade. Disclosure: I have no pairs positions on at this time, but I could enter in any of the aforementioned positions at any time in the near future. OK, I was wrong (see recent posts Getting close to a bottom, but not yet and A Bold Forecast: Today was not the bottom). The Trend Model trading call reversed itself and moved from a bearish to a bullish reading this week (see my tweet here). I had been applying a technical analysis approach to the latest round of market weakness when that framework was inadequate for the job. an oil shock that will also be deflationary, but will be expansionary for many economies. The combined effects of all this should be unequivocally supportive for bonds, but ambiguous or even supportive for some global equity markets. As for last week's market activity, Jones said that on Thursday we saw a five standard deviation (that's a volatility measure) kind of movement in one day. He said we would see this kind of volatility in the future. In early October, a confluence of events transpired in relatively short order, including weaker economic data, political uncertainty, a potential global plague, and bureaucratic meddling, which caused fear to spike, sentiment to decline, and investors to de-leverage. The month got off to an especially rocky start for hedge funds when a court dismissed a claim in connection with the Fannie Mae/Freddie Mac GSE complex. Many investors were oversized in this trade and their forced selling kicked off the “de-risking” cycle. Next, oil prices declined sharply and many funds who had large positions in E+P companies suffered enormous losses. Then last week, AbbVie halted its announced inversion transaction with Shire, inflicting great pain on the arbitrage community. Opaquely blaming mysterious “meetings with the Treasury Department”, AbbVie walked away from an entirely lawful deal that it had touted as enormously accretive and strategic as recently as two weeks ago, incurring a substantial $1.6 billion break-up fee. A rational conclusion is that instead of a legislative solution that might require comprehensive tax reform, this Administration has decided to unilaterally curb inversions using whatever means are available. Needless to say, this regulatory uncertainty (along with prior detours from the rule of law) will be a wet blanket on top of investors until transparency and a level playing field are restored to the markets. The de-risking sentiment that prompted investors to dump stocks, however, is likely to lose steam sooner, according to Credit Suisse Head of Flow Equity Derivatives Trading Khoa Le. “A lot of people were caught on the wrong side of market volatility, and the majority of flows we saw were essentially closing positions,” he said on a recent conference call. “Effectively, you had the buy-side community saying, ‘We’re out.’” If volatility spikes again soon, they’ll probably stay out. But if it remains subdued, they will likely feel pressure to come back in. Against this backdrop, European growth continued to slow. 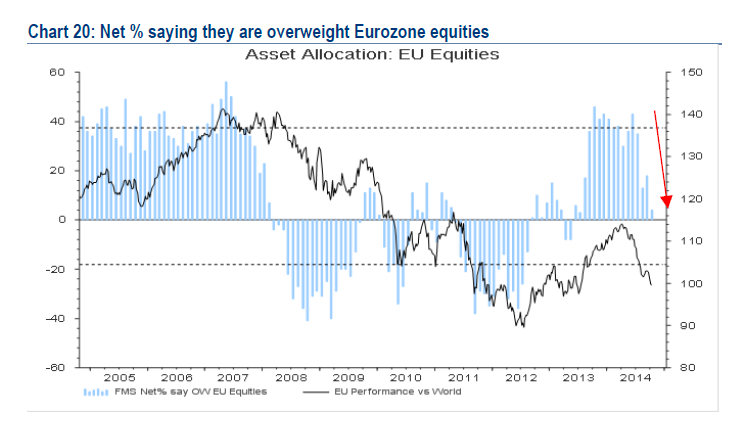 The BoAML Fund Manager Survey showed that institutional managers were overweight eurozone equities and were in the process of reducing their positions. When the fast money crowd (read: hedge funds) were forced to de-risk and reduce their position sizes, the expectations of slower global growth set off a stampede for the exits. If the scenario that I outlined is correct, then we need to more or less throw out all the technical analysis around the brief correction as it was only a momentary panic. It's time to get back to fundamentals and the real world. Where does the market stand today? Last week, I highlighted analysis from John Butters of Factset on the US earnings season and outlook. 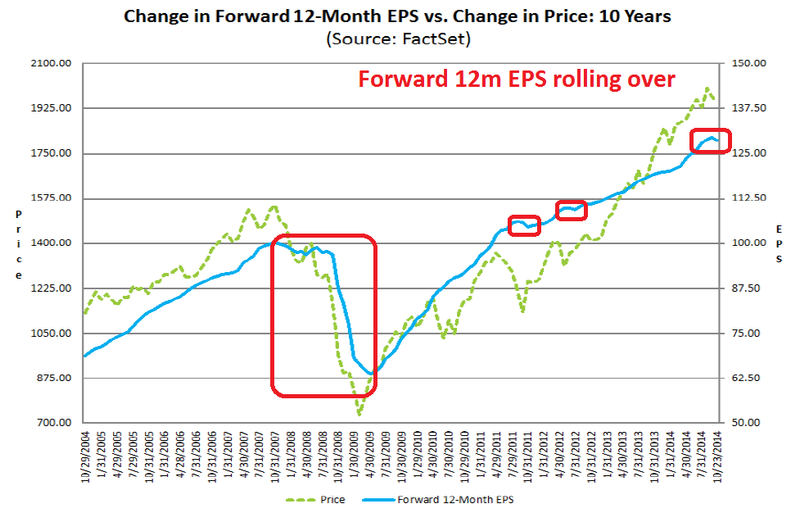 Here is the updated Factset chart of how consensus forward 12 month EPS estimates are evolving (annotations in red are mine). Earnings Scorecard: Of the 208 companies that have reported earnings to date for Q3 2014, 75% have reported earnings above the mean estimate and 60% have reported sales above the mean estimate. Earnings Guidance: For Q4 2014, 29 companies have issued negative EPS guidance and 8 companies have issued positive EPS guidance. For investors, the current period of stalling forward EPS growth is not a signal for panic, as forward EPS does not appear to lead the stock market. Rather it seems to be, at best, a coincidental indicator. On a quarter-over-quarter basis (SAAR), U.S. economic growth has been inconsistent in recent quarters. In Q4 2013, Q1 2014, and Q2 2014, quarter-over-quarter (SAAR) GDP growth rates for the U.S. were 3.5%, -2.1%, and 4.6%. According to FactSet Economic estimates, quarter-over-quarter (SAAR) GDP growth for the third quarter is estimated to be 3.0%. Despite the inconsistency, a number of companies to date have reported strong results from the U.S. and North America in their third quarter earnings releases and conference calls, or see continued strength going forward. On a quarter-over-quarter basis, economic growth in Europe has been weak in recent quarters. In Q4 2013, Q1 2014, and Q2 2014, quarter-over-quarter GDP growth rates in the Eurozone were 0.3%, 0.2%, and 0.0%. According to FactSet Economic estimates, economic growth in the Eurozone is expected to remain weak, as quarter-over-quarter GDP growth in the Eurozone is estimated to rise 0.2% for the third quarter. Companies have generally provided mixed comments regarding Europe. Some companies have commented on deteriorating conditions in Europe. On a year-over-year basis, economic growth in China has been declining in recent quarters. In Q3 2013, Q4 2013, and Q1 2014, year-over-year growth GDP growth rates in China were 7.8%, 7.7%, and 7.4%. In Q2 2014, there was a slight uptick in GDP growth to 7.5%. However, year-over-year GDP growth in China dipped back to 7.3% for the third quarter. Despite the slowing growth, most companies have been positive in their comments regarding China in their third quarter earnings releases and conference calls. In the coming week, most American investors will be watching the FOMC announcement for clues as to the direction of future policy. While Fed policy is important to the markets, I will be keeping an eye on Europe for clues as to the longer term equity market outlook. Mr. Dudley has elevated the strength of the dollar and soft global growth as factors affecting the Fed’s policy thinking. He said the strong dollar puts downward pressure on U.S. inflation and dims U.S. near-term export prospects, factors that keep the Fed patient about raising rates even as the job market improves. It’s unusual for a senior Fed official to speak so directly about the impact of the currency on his thinking, in part because the currency is supposed to be the domain of the U.S. Treasury. In a progressively integrating world economy and financial system, a central bank cannot ignore developments beyond its country's borders, and the Fed is no exception. This is true even though the Fed's statutory objectives are defined as specific goals for the U.S. economy. In particular, the Federal Reserve's objectives are given by its dual mandate to pursue maximum sustainable employment and price stability, and our policy decisions are targeted to achieve these dual objectives.Hence, at first blush, it may seem that there is little need for Fed policymakers to pay attention to developments outside the United States. But such an inference would be incorrect. 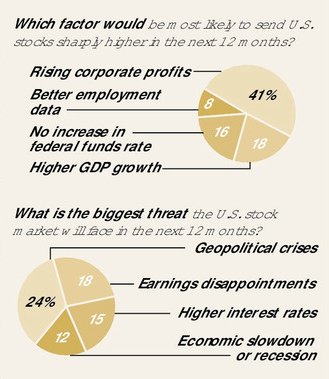 The state of the U.S. economy is significantly affected by the state of the world economy. A wide range of foreign shocks affect U.S. domestic spending, production, prices, and financial conditions. To anticipate how these shocks affect the U.S. economy, the Federal Reserve devotes significant resources to monitoring developments in foreign economies, including emerging market economies (EMEs), which account for an increasingly important share of global growth. The most recent available data show 47 percent of total U.S. exports going to EME destinations. And of course, actions taken by the Federal Reserve influence economic conditions abroad. Because these international effects in turn spill back on the evolution of the U.S. economy, we cannot make sensible monetary policy choices without taking them into account. Although the effect of the U.S. economy on other countries is of vital importance to this audience, I will briefly digress to remind you that developments in other economies also can have significant spillovers to the United States, which in turn prompt reactions from U.S. policymakers. For example, in the past few years, the deflationary environment in Japan, together with the fallout from the euro-area fiscal crisis, has entailed persistent weakness in those economies, which historically have been among our most important trading partners, are major recipients of our foreign investments, and loom large in the international credit exposures of U.S. banks. These effects have weighed on global growth, which needs to be taken into account in the setting of U.S. monetary policy. Although much of the recent commentary on spillovers has focused on the United States, it bears mentioning that other countries' monetary policy announcements can leave an imprint on international asset prices, with market reactions to new initiatives announced by the European Central Bank (ECB) in the past few weeks the most recent example.13 However, event studies tend to find larger international interest rate spillovers for U.S. policy announcements than for those of other central banks. No doubt, Fed officials are keeping a close eye on the events in Europe (also see my recent post The Draghi Grand Plan 2.0 which featured a video of a Mario Draghi speech where he shared the stage with, surprise!, Stanley Fischer). The European Central Bank bitterly disappointed investors who had expected the bank to follow the Federal Reserve’s example and announce dramatic monetary measures, combined with a convincing recapitalization of the European banking system, at European Central Bank President Mario Draghi’s press conference on Oct. 2. The rout in global stock markets began the day after. Meanwhile, the German government has continued to demand immediate spending cuts from France and Italy while hobbling German industries with Russian sanctions — despite the evidence that both its European austerity drive and diplomatic policies were economically damaging and counterproductive. It has begun to look as if Europe may stubbornly refuse to follow the U.S. roadmap for economic recovery. If that happens, the improving U.S. economy can no longer be treated as a leading indicator of European recovery. With this, the prospects for the global economy would be much diminished. While the chances of a renewed financial crisis in the euro zone are greatly increased. Europe is starting to look like 2011 all over again. To be sure, the eurozone was facing an existential crisis in 2011 as it appeared that Greece could have exited the euro during its debt crisis. Then, we saw the crisis and disagreements erupt publicly as summits progressed on an almost weekly basis. Europe is at a make or break moment. Two very different events on Sunday, occurring at opposite ends of Europe, will largely determine the entire continent’s direction for years ahead: the parliamentary election in Ukraine and the bank “stress tests” and Asset Quality Review conducted by the European Central Bank. Before explaining the significance of these two events, and their unexpected linkage, I need to mention a third announcement, due next Wednesday: the European Commission’s verdict on the budget for 2015 submitted last week by the French government. The Commission will next week have to come up with a Solomonic judgment that somehow reconciles the French government’s determination to stimulate its economy by cutting taxes with the German-imposed “fiscal compact” that former-President Nicolas Sarkozy rashly accepted in a moment of desperation in the 2012 euro crisis and which requires France to raise taxes or drastically cut spending in order to reduce its budget deficit to 3 percent of GDP. The fiscal compact rules, if applied literally, would make economic recovery in France a mathematical impossibility. Yet bending these rules will provoke a German public backlash, and perhaps even a constitutional court challenge, that could even force Angela Merkel to renege on her commitment to support the rest of the euro-zone. Depending on how these three events turn out, Europe will either be on the road to a moderate economic recovery next year or it will condemned to permanent stagnation, possibly leading to the break-up the euro or even the European Union as a whole. Personally, I would downplay the threat from the first two events. The markets have largely discounted the Russia-Ukraine situation, much like it has discounted the Hong Kong pro-democracy protests. Nevertheless, there appears to be an upside surprise here as the latest reports indicate that pro-European coalition led by Poroshenko will dominate the new Ukrainian parliament. Starting with the Ukrainian election, a victory for President Poroshenko’s moderate party should allow EU leaders to launch a genuine peace process that recognises the loss of Crimea as irreversible and acknowledges Russia’s vital interests in maintaining the military neutrality of its immediate neighbours. Once these basic conditions are satisfied, a rapprochement with Russia should become possible, allowing sanctions to be gradually dismantled or at least confirming that sanctions will expire by mid-2015, as currently legislated. Removing the threat of war or further sanctions in eastern Europe will have a major beneficial effect on businesses in Germany and Italy, which been hurt much more by the confrontation with Russia than European leaders expected. Sunday’s completion of the AQR has always looked like a necessary, though not sufficient, condition for a substantial improvement in monetary policy. This is because the ECB wants to stimulate private borrowing, as Britain did with the sub-prime mortgage subsidies it announced in March 2013, rather than supporting public debt, as in U.S. and Japanese quantitative easing. For this plan to work, European banks must be recapitalized and cleaned up, which the AQR is designed to achieve. If Sunday’s AQR plan proves convincing (admittedly still a big “if”) the stage will be set for the ECB to announced some serious monetary stimulus at its next meeting on Nov. 6. Since he wrote those words, the AQR results have been published and 25 banks failed the tests but 12 have already taken steps to address the capital shortfalls since then. The good news is there are no big German or French banks on either list and the problem banks are concentrated in the troubled peripheral countries, with Spain as the outperforming outlier. All that needs to be raised is €9.5 billion, which is in the low end of estimates. Kaletsky thinks that we could also see an upside surprise when the Commission reviews the French budget. No doubt, we will at some point see the usual European grand bargain struck behind closed doors, where the letter of the rules are respected but possibly not their intent. Finally, a U-turn on fiscal austerity is highly probable when the Commission delivers its verdict on the French budget on Oct. 29, or failing that, in mid-November after a symbolic “re-negotiation” leading to some cosmetic strengthening of French structural reforms. If the events of 2011 are to serve as a template for the markets of 2014, then the big question becomes one of where are we in 2011. Are the markets in the shaded area when stocks tanked, rallied and chopped up and down during the period of uncertainty? Or have we seen, or about to see, the policy response like the LTRO announcement that eventually propelled equity prices to another bull phase? On one hand, we have started to see a policy response from the authorities. The ECB announced that it may consider asset purchases of corporate debt. While it is technically not QE, which buys government debt and a no-no for the Germans, such an action does open the door to the expansion of the ECB balance sheet. As well, we saw a policy response from the Chinese the PBoC indicated that it would inject liquidity to the tune of 200 billion yuna on October 17. At about the same time, St. Louis Fed Governor James Bullard surprised the market by saying that the Fed should consider delaying the end of QE. Is that enough of a policy response? According to German officials, Merkel felt betrayed by Draghi's speech at a central banking conference in Jackson Hole, Wyoming in August in which he pressed Berlin for looser fiscal policy to stimulate the economy. Her entourage is also deeply sceptical about Draghi's plan to buy up asset-backed securities (ABS) and covered bonds in the hope of encouraging commercial banks to lend. Most of all, politicians in Berlin worry that if this scheme doesn't work, the ECB president will be tempted to launch full-blown government bond buying, or quantitative easing. This is a taboo in Germany and a step Merkel's allies fear would play into the hands of the country's new anti-euro party, the Alternative for Germany (AfD). German Chancellor Angela Merkel thanked ECB President Mario Draghi for spelling out to leaders at an EU summit that governments must play a role in boosting the faltering euro zone economy, and said it was their firm intention to do so. "I am very thankful to Mario Draghi for holding up a mirror for us once again," Merkel told a news conference in Brussels on Friday, a day after Reuters reported tensions in the relationship between Berlin and the Italian ECB president. "Monetary policy can do some things, that is the job of the independent European Central Bank. But if fiscal policy doesn't react simultaneously, if we don't improve our economic policies, our competitiveness and our investment climate, then we won't come out of this unsatisfactory situation," Merkel said. She added that leaders had expressed their "clear intention" to do all this in response to the weak economy. You have to love European theatre! 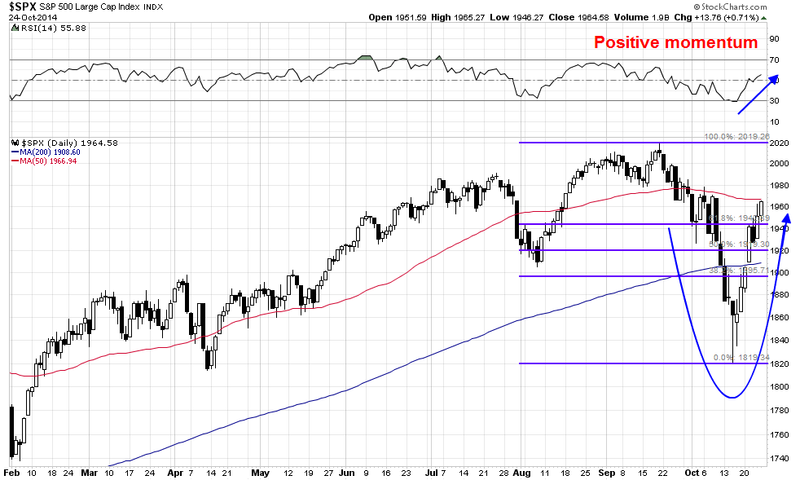 As we approach the week ahead, the SPX has rallied strongly from a V-shaped bottom. It sliced through the 200 day moving average resistance in a single day and it's now approaching the 50 dma. 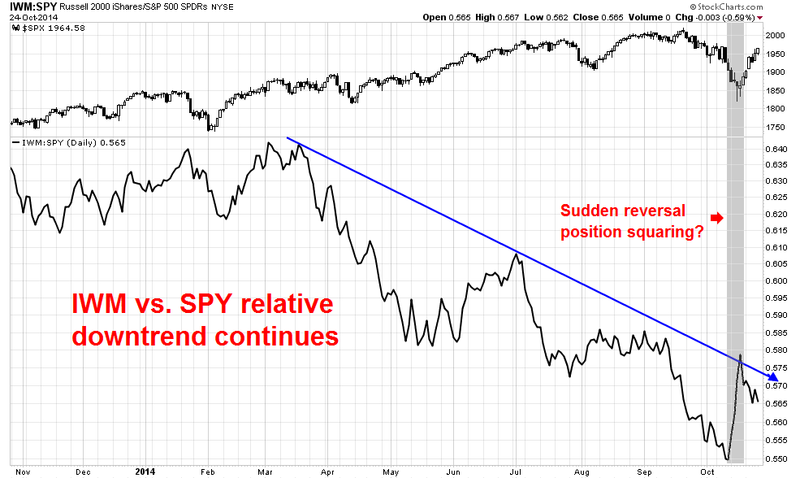 Momentum indicators remain positive and the 14-day RSI is not yet in overbought territory. Given the violence of the recent up and down moves, I would not be surprised to see some degree of consolidation in the week ahead with pullbacks to test any of the Fibonacci retracement levels or the 200 dma, though a further advance cannot be ruled out. In effect, the markets are normalizing after the downdraft and reversion of the last few weeks. The behavior of the small cap stocks have also normalized as well. 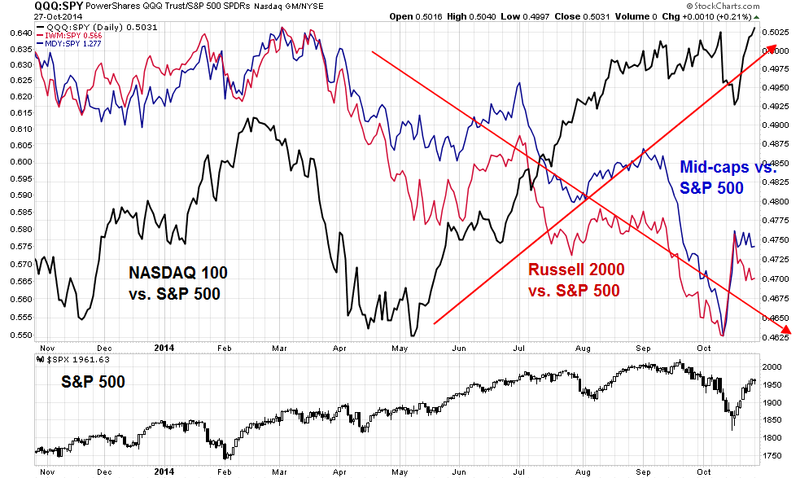 The relative performance chart below of the Russell 2000 against the SPX tells the story. The shaded area shows the outperformance of small caps during the market swoon and their reversal soon after. This pattern is consistent with the hedge fund re-positioning thesis. Many long-short funds buy individual favored stocks and then hedge with short positions in the Russell 2000. If forced to reduce their positions, they would naturally buy back their Russell 2000 short positions, which put upward pressure on the small cap index during the unwind. When they finished, the relative downtrend of small caps relative to large caps continued. My inner trader is nervously long and prepared for volatility. My inner investor is asking, "Correction, what correction?" Branko Milanovic, the Lead Economist at the World Bank research group, said in so many words the Left in developed countries won the genetic lottery but they didn't even know it (my words, not his). The chart below shows who won and lost in the inequality race globally. The x-axis on the bottom splits the world population from the poorest on the left in subsistence economies to the richest on the right, while the y-axis shows the real income growth in PPP terms between 1988 and 2008. In the thirty years spanning 1988 and 2008, the winners in the inequality race were the middle class in emerging economies, because of the effects of globalization, and the very rich, who engineered the globalization revolution. The losers were the very poor in subsistence economies, who weren't able to benefit from and the middle class in developed economies, who did not receive the benefits of the productivity gains (see Rex Nutting's analysis above) in the last few decades. It is now clear clear that the exceptional acceleration in emerging market growth between 2006-2012 is over. Even if the IMF predictions from 2015-2019 turn out to be correct (see chart below), the Middle East and North Africa, and Sub-Sahara Africa would be the only geographic regions where growth in those five years would be comparable with the period from the mid-1990s to 2012, according to IMF statistics. Successful economic development now looks a much tougher challenge, and perhaps only a handful of countries can expect to join the select group of 35 high income countries (income per head over $20,000), not counting the 14 low population and small island states. Countries such as Poland and Chile are knocking at the door, but the countries in this universe look increasingly like the exception not the rule. Lower commodity prices would amount to lower input costs for US businesses. In addition, lower oil prices amounts to an implicit tax cut for the consumer. In addition, an onshoring trend would increase US employment. All these effects could amount to an American Renaissance. 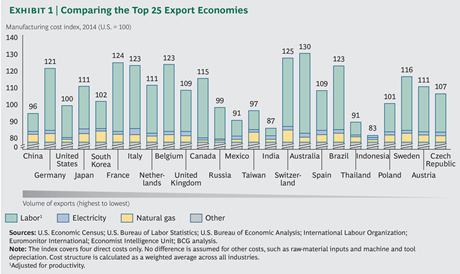 The chart below from Boston Consulting Group shows the operating costs in each country. Note that the costs for China, once the preferred go-to country for offshoring, are not very different from the US and not competitive relative to Mexico. BCG went on to summarize the recent winners and losers in operating costs. 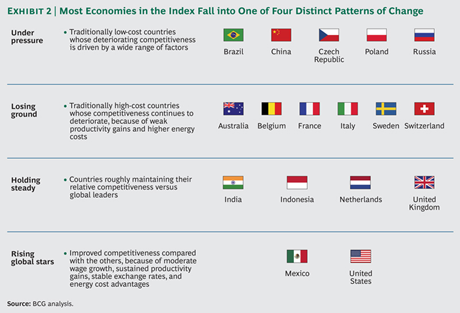 The main conclusion drawn from this chart shows that the losers were EM countries, while the US and Mexico were the winners. The combination of rising middle class employment, income and lower fuel spending costs would therefore see greater gains by the developed market middle class - and moderate complaints about the income inequality in the next decade. However, it is an instructive irony that although the trends are now right for U.S. reshoring, conditions on the ground are not always so favorable. That's because 40 years of offshoring have done a lot of damage to what Gary Pisano and Willy Shih have called the nation's "industrial commons"—the shared resource base of skilled workers and supply chains upon which all manufacturers draw. Shih injects a dose of realism into the reshoring discussion. He notes that both GE and Google’s Motorola Mobility unit faced enormous difficulties in hiring adequate numbers of appropriately skilled people for their factories. Appliance Park started with 10,000 applications for an initial 2012 posting. Of the 6,100 who passed the screening, 730 were hired but 228 were terminated in the first year. Fort Worth had to hire 6,500 workers to yield the required 2,500 employees to begin volume production. In both cases, a lack of basic familiarity with modern precision manufacturing among new hires led to a lot of turnover. At the same time, managers at both Appliance Park and in Fort Worth faced hollowed-out local supply bases. Almost all the parts for the MotoX had to come from China, Korea or elsewhere in Asia, while GE encountered reduced capacity in its supply base for appliance parts. As of now, Appliance Park has basically succeeded in Louisville (though GE has signaled that it wants to sell its appliance division) while the Motorola—which Google is selling—said recently it will close the MotoX facility in Fort Worth due to lackluster sales and high costs for labor and shipping. In the long term, the story of slowing EM growth, falling commodity demand and onshoring will continue in fits and starts. Nevertheless, this trend is likely to result in better developed market middle class income growth over the next decade. This paper does not contain policy advice. Instead, it contains analysis that largely demonstrates there are direct, and possibly causal, relationships between economic inequality and growth—places that begin with a lower level of inequality subsequently tend to grow faster and have longer periods of growth than those with a higher level of inequality. In future research, we will focus on the channels through which inequality could or does affect economic growth. If inequality were to be reduced in the developed market economies, then it would mean a brighter future for these economies in the decades ahead. The current level of concern expressed about economic inequality may therefore represent the generational high tide mark of this debate. The parents fight and the kids hear everything. The younger, more naive ones, think that the parents are on the verge of a divorce, but nothing could be further from the truth. That`s the picture of Europe today. The outsiders are the young kids listening to the fights between European leaders. The ECB taking steps to temporarily hold things together and buy time so that member eurozone governments enact reforms. Structural labor market reforms to encourage labor flexibility and breaking the social compact of lifetime employment for entrenched older workers. In a currency union, the peripheral countries cannot devalue their currency to become more competitive. They have to enact painful reforms that amount to internal devaluation. In effect, German wages go up and PIIGS wages go down. Despite the pain, those initiatives have largely pushed the eurozone in the right direction. 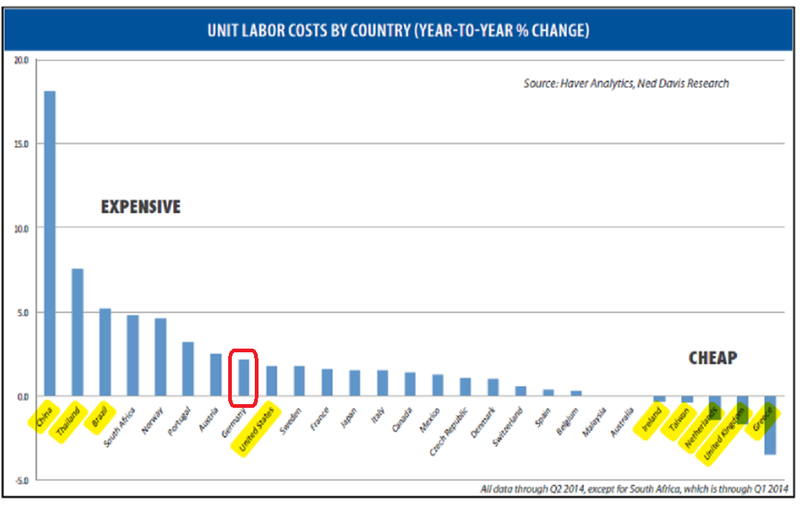 As the chart from Ned Davis Research shows, progress continues as unit labor costs of most eurozone countries have declined YTD relative to Germany and indeed, EM manufacturing powerhouses like China. In his speech, Draghi outlined the third leg of Grand Plan. In addition to the components of Grand Plan 1.0, Grand Plan 2.0 includes infrastructure spending for member states that have the fiscal flexibility to do so. In practical terms, it's an infrastructure fiscal spending for structural reforms bargain within the eurozone. Infrastructure spending is a bit like motherhood and apple pie. Everyone can agree that it’s basically a good thing, serving the dual purpose of providing both a short-term boost to employment and, assuming it’s wisely allocated, a long-term increase in the economy’s productive potential. But to think that in itself such spending provides a solution is a complete misdiagnosis of the problem. Warner explained that many European countries don`t need more infrastructure, so why build more bridges to nowhere? Nor, in any case, is it always worthwhile. No one would think that the economic stagnation which has settled on France is for want of infrastructure spending – it has some of the best infrastructure anywhere in the world. Similarly, some of the other troubled economies of the eurozone – Spain, with its empty regional airports, and Portugal and Ireland with their traffic-free highways – hardly need more such spending. As in China, the problem in these countries has if anything been one of over-investment, rather than lack of it. There is also a basic problem that afflicts all publicly initiated infrastructure spending – much of the time, it is guided by government vanity and pork barrel politics. Glamour projects, such as high speed rail, tend to assume precedence over more mundane, but perhaps better targeted, spending on improving the existing transport network. As with the kind of reforms undertaken with Grand Plan 1.0, these kinds of initiatives are much harder to achieve than politicians deciding to write a cheque for more roads, railways and airports. These kinds of changes are hard and take a lot of work. Draghi was probably thinking of the kinds of achievements outlined in this Project Syndicate essay (Make your own Silicon Valley), where Finland created a cluster of gaming startups that export 90% of their products and the Dutch started a big-data hub that resulted in the Netherlands Institute for Radio Astronomy. No one said that these changes are going to be easy, but my guess that Europe will eventually move in that direction. Currently, there are numerous German objections to the plan for more fiscal spending, but the Germans will eventually waver. That`s because France is becoming the new sick man of Europe. The French-German alliance represents the heart of Europe. No doubt we will see lots of German protest and likely 2011-style emergency-summits-every-other-week before this is over, but everyone involved understands that France is too big to save. The German government on Tuesday slashed its growth outlook, saying the country's economy was navigating "difficult waters" because of worsening conditions around the world. German Economics Minister Sigmar Gabriel said Berlin expected gross domestic product (GDP) to expand by only 1.2 percent in 2014, down from an earlier estimate of 1.8 percent. He also revised projections for next year to 1.3 percent annual growth from 2 percent. "Geopolitical crises have also increased uncertainty in Germany with the only moderate global economic development acting as a drag on the economy," Gabriel added. Germany’s state governments stepped up calls for infrastructure spending, adding another source of pressure on Chancellor Angela Merkel to boost investment as economic growth falters. Much like Merkel’s national government, the states are caught between a deteriorating growth outlook and the balanced-budget drive that Germany started in response to the euro area’s debt crisis. It’s making the 16 regions set aside political differences to challenge the status quo, from rich Bavaria to rural Mecklenburg-Western Pomerania in the east, home to Merkel’s electoral district. A day after the German government lowered its growth outlook, proposals to spend more on projects such as highways in Europe’s biggest economy are on the table at a retreat of state premiers starting today that Merkel plans to attend. “To unleash growth impulses, additional investment is needed in infrastructure and other future-oriented sectors,” according to a summary of the states’ negotiating position in fiscal talks with the federal government that was prepared for the meeting in Potsdam and obtained by Bloomberg News. The states want a “lasting” funding boost, saying a lack of spending is holding back economic development nationwide. The struggle in Germany parallels the international conflict pitting Merkel and Finance Minister Wolfgang Schaeuble against the International Monetary Fund and countries such as France and Italy that advocate spending to stimulate growth. The theatre may be upsetting for some, but Europe is a place where the elite makes deals behind closed doors. Watch for Merkel et al to relent and effect a fiscal stimulus for structural reform bargain, but not before a lot of Sturm und Drang to show the hardliners that they tried but compromised for the sake of European unity. José Manuel Barroso wrote that unity is the "is a condition sine qua non of the EU’s economic prosperity and political relevance" and it is a quality that embedded in the DNA of every member of the European elite. Everyone understands those core values. Watch for the endpoint. The Draghi Grand Plan 2.0 will implemented in some fashion. In my weekend post, I wrote that the US equity market is getting close to a bottom (see Getting close to a bottom, but not yet), but I neglected to add the likely bullish effect of the US midterm elections in November. 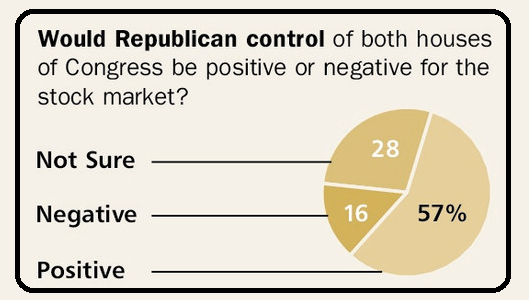 As things stand today, the Republicans have lock on the control of the House. 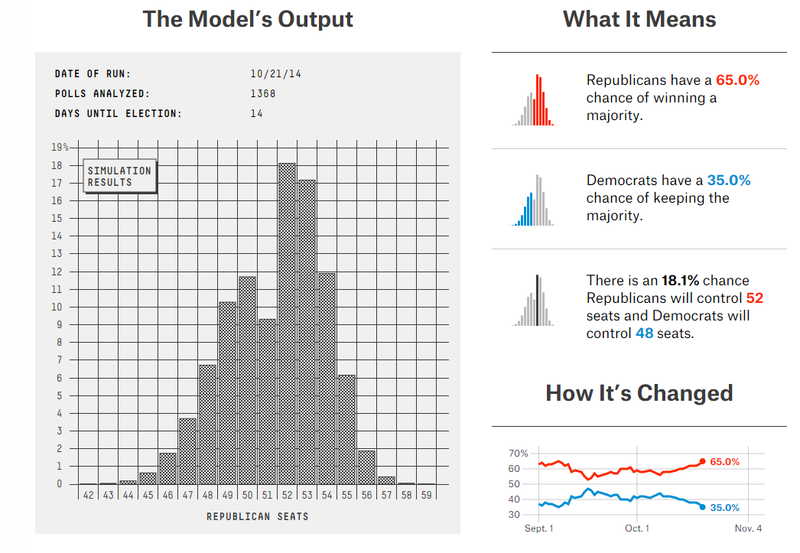 The latest FiveThirtyEight forecast is that the GOP has a 65% chance of controlling the Senate, though other polling organizations have higher odds. The sports books odds at PaddyPower shows a 79% chance of the Republicans taking the Senate. In the past few weeks, Wall Street has been pre-occupied with other distractions, such as China, Europe, Russia-Ukraine, Ebola, etc. I have seen little discussion of the likely impact of the November electoral results on the markets. Therefore the election of a Republican controlled House and Senate, which are considered to be more business friendly than the Democrats, should provide a bullish boost for the stock market in early November. The response from the Barron`s Big Money Poll is confirms this view. This scenario is also consistent with the one I indicated on Sunday of a market bottom in the next week or two. In many policy areas, a shift in Senate control would simply result in a new flavor of the gridlock that has prevailed since the 2010 election. The split between Congress and the White House would still exist and, while Republicans would set the agenda in both chambers if they held a majority, a degree of bipartisan support would still be necessary in the Senate light of the 60-vote threshold necessary to pass most legislation. The exception would be the annual budget resolution and legislation related to it. The budget resolution sets out annual targets for federal spending, revenue, and debt. More importantly, it can be used to clear a procedural path for legislation that includes policies to reconcile the level of spending, revenue, or debt under current law with the levels in the budget resolution. Such “reconciliation” legislation is not subject to filibuster and can therefore pass both chambers with only a simple majority (i.e., 51 votes in the Senate). The result is likely to be less predictability regarding the process surrounding major fiscal deadlines. Since the confrontation between House Republicans and the White House over the debt limit in 2011, markets have gradually become inured to fiscal brinksmanship, as these debates have started to follow a predictable pattern. If Republicans win majorities in both chambers as polls currently suggest they might, that pattern seems likely to change, which could lead to renewed uncertainty ahead of future fiscal deadlines. By all means, position for a tactical rally in US equities at year-end, but don't be so quick to celebrate. Be aware of another looming Washington budget crisis early next year. Be forewarned: The market gods giveth and they taketh away. What do the pros REALLY think about the market? WTF? 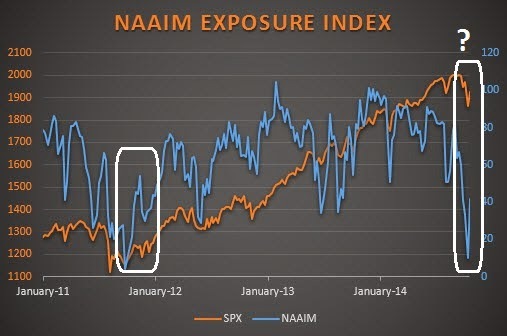 How can managers be both bearish (NAAIM), mildly bullish (FMS) and extremely bullish (BM) on US equities all at the same time? 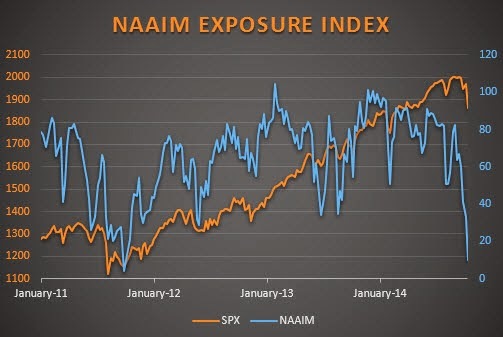 In addition, the NAAIM survey readings seem highly unusual to me. The swings in asset allocation in NAAIM sample do not correspond to the behavior of any institutional manager that I am familiar with. Most institutional managers have individual mandates, e.g. 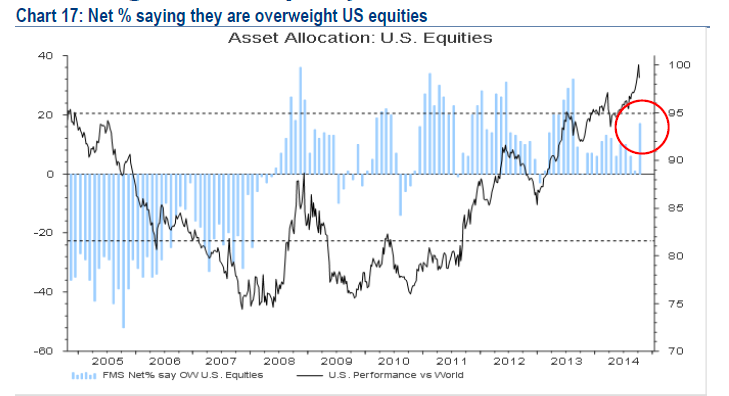 US large cap equities, HY bonds, etc., which require them to stay fully invested. A cash level of more than 5% is unusual under most circumstances (imagine how you would react if you bought SPY and its NAV underperformed in a market rally because the manager decided to hold 20% cash). It all became more clear to me when I read the survey sample discussions of each of the polls. My former Merrill colleague Walter Murphy indicated to me that the NAAIM sample consists of RIAs investing money on behalf of their clients. In other words, these are individual mom and pop investment advisors with discretionary authority over client funds. An overall total of 220 panellists with $640bn AUM participated in the survey. 176 participants with $508bn AUM responded to the Global FMS questions and 103 participants with $264bn AUM responded to the Regional FMS questions. Now that the sample question are resolved, my conclusion is that the RIAs panicked during the recent risk-off period, while the US institutional managers turned more bullish on US equities and global and non-US managers drew back their risk profile a bit to benchmark. The responses also highlighted the kind of macro risks involved in the forecasts. 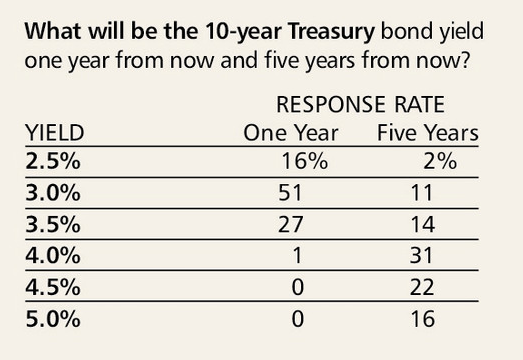 Consider that, according to Barron`s, manager expect 10-year Treasury yields to rise to between 3.0-3.5% next year. Wow! That represents a rise of roughly 1% in the 10 year yield in the context of a rising stock market. That would suggest a very robust earnings and economic growth scenario, which is shown below. Here is the key risk: Either growth expectations be unrealistically high or the bond yield forecast wrong. 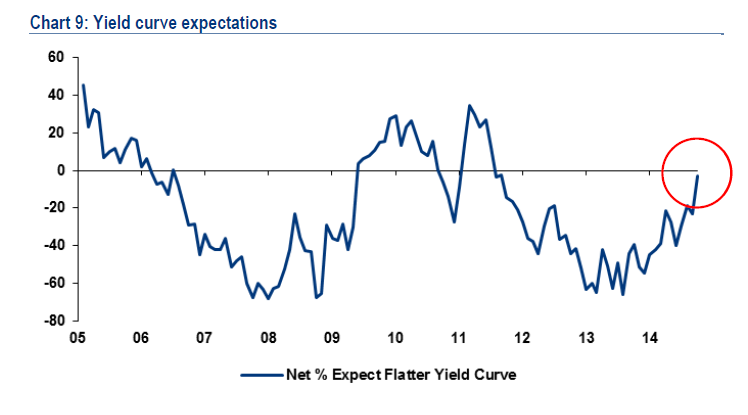 In addition, the BoAML survey shows a majority of managers expect a flattening yield curve. If both the Barron`s sample and the BoAML samples are correct, then that will imply 10-year yields will rise to 3.0-3.5% while the yield curve flattens - meaning an unexpected spurt in the short end indicating that the Fed will tighten far more aggressively than the market expects. Somebody is very wrong, but there are undoubtedly opportunities in betting against the consensus here. 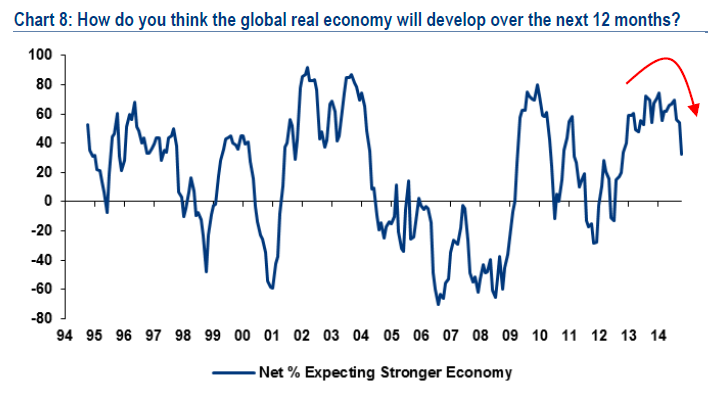 To be sure, the BoAML survey is far more global in nature and those survey results reflect the angst that managers feel over the non-US economies. Macro risk is rising in the eurozone and China in the form of growth slowdowns. The cautiousness shown in that sample stands in stark contrast to the bullishness to the US money manager sample of the Barron`s survey. That`s why it`s important to understand the differences in respondent populations before interpreting the data and jumping to conclusions. In the end, professional money managers are not that different than you or me. There are tall ones and short ones, white ones and brown ones, male and female and they come in all shapes and sizes. That`s why I do tend to tread carefully when I read these survey results. I prefer to watch either market based indicators, e.g. option premiums and skews, or focus on questions about what they`re doing with their money, e.g. 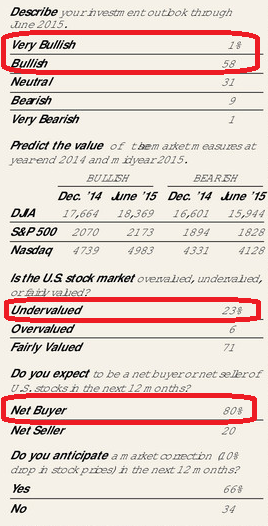 AAII asset allocation survey, rather than what they think, AAII bull-bear survey. The Ebola correction? Oh, PUH-LEEZ! A Yom Kippur bottom? Or just more volatility?